Last week’s data released by the Census Bureau vividly demonstrated the growing income inequality in the U.S. But deeper in the data, there’s another related finding that is also striking: The growing income accruing to the nation’s college-educated households. Between 1991 and 2012, the aggregate household income of college-educated households increased by $2.1 trillion according to the Census data. 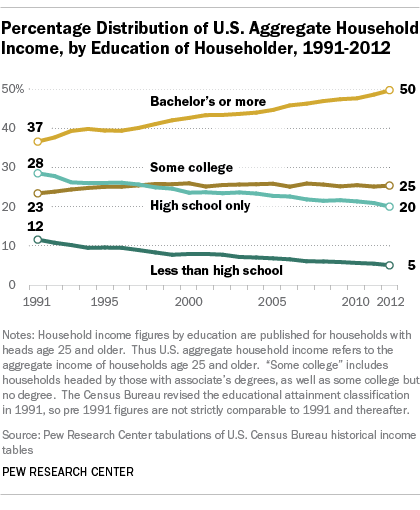 Over the same period, the share of all households who are college educated increased from 23% to 33%. How much of the $2.1 trillion income gain received by the college educated is due to growth in numbers versus growth in income per college-educated household? If the fraction of households who are college educated had remained constant at 23%, instead of rising to 33%, the income pie going to the college educated would only have grown by $0.8 trillion. 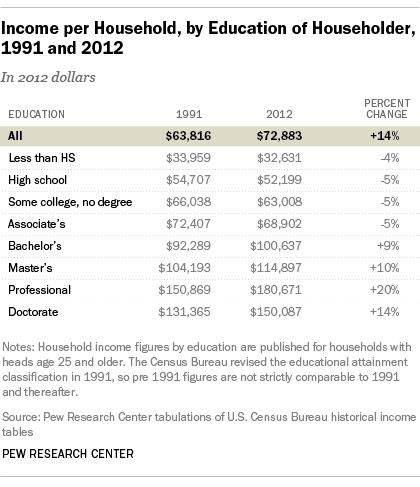 So, over half of the income gain of the college educated is due growth in numbers. But a substantial portion reflects their improving income fortunes.